No, I haven’t gotten back together with ATK. But I still have some of their recipes floating around my kitchen which need to make their way to the blog. Like this stovetop mac and cheese. I’ve had it in my life for almost four years and yet I haven’t yet shared it with you. And that’s just wrong. Because in the world of quick and easy cooking, it doesn’t get much better than this. In the time it takes to get your water to a boil and cook the pasta to al dente, the sauce is ready to receive the macaroni and coat it in its luscious, creamy goodness. I think that should be enough motivation to put this on your menu soon. 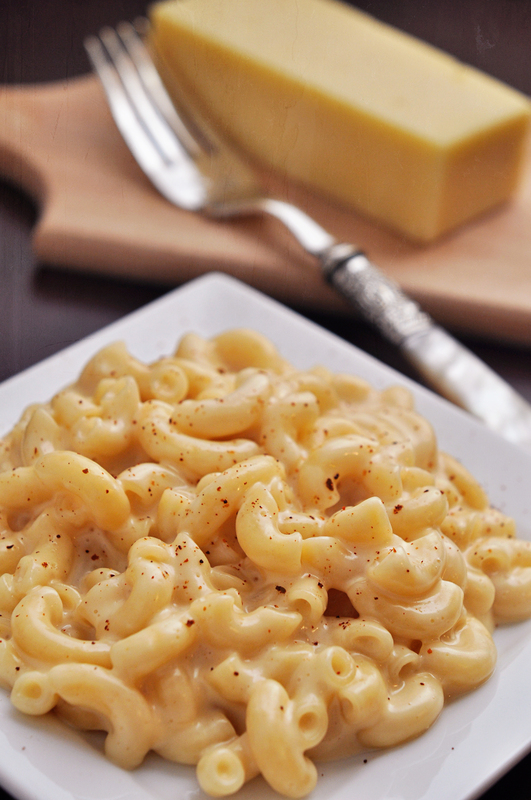 Confidential to Jenna…I know you didn’t exactly hit it off with the last stovetop mac and cheese I raved about. I hope you’ll have a better experience with this. BAH Note: The recipe I worked from was actually a “lighter” mac and cheese that used low fat this and light that. I personally don’t eat pasta often. So when I do, it’s a big deal and I go all out. If you find you’re making this on a regular basis, you may want to consider using the reduced fat versions of milk, evaporated milk, and cheese. Also, ATK didn’t name the recipe Kerrygold Mac and Cheese….that was all my doing. Do yourself a huge favor and try it at least once with Kerrygold Cheddar…and you’ll see why. But note that the blocks of Kerrygold are only 7 ounces. That missing ounce didn’t make any difference in my sauce. Bring a large pot of salted water to a boil and cook the macaroni according to the package directions until it is al dente. If your pasta is done before the cheese sauce is ready, drain the pasta and leave it in the colander while the sauce finishes. Mix the cornstarch with 1/4 cup of the milk or half and half in a small bowl until dissolved and set aside. Meanwhile, whisk together the evaporated milk, the remaining 1/2 cup milk or half and half, and dry mustard in a pot or dutch oven and bring to a boil. Reduce the heat slightly and whisk in the cornstarch mixture. Continue to simmer, whisking often, until the sauce thickens and is smooth, approximately 3 to 5 minutes. Once the sauce has thickened, turn off the heat and add the grated cheese. Stir until the cheese is completely melted and the sauce is smooth. Stir in the pasta, taste for seasoning, and add kosher salt as desired. Let the macaroni and cheese sit for about 5 minutes before serving, garnished with a very light sprinkle of cayenne pepper or chili powder. Anna, can you get Kerrygold cheeses there in Australia? If so, you HAVE to try this. It’s creamy and delicious with just a wee bit of kick. That looks like something I’d be dangerous with. Can’t wait to hear what Jenna thinks! Kitch, I can’t imagine the person exists who would not like this dish. Sadly, I’m married to him. The man hates cheesy sauces with a passion, actually gags at the thought or taste of them. As a lover of all things cheese, it *KILLS* me. I’m going to have to make this for myself and just eat it all for days. Because it MUST be made. It looks SO good, Wendi. Amber, my husband also suffers from an aversion to creamy mac and cheese sauce. So I came up with a compromise. The next time I make it (which will actually be later today), I’m dividing it in half and putting his portion in the oven to bake off. Makes me shudder to think of abusing that beautify cheese sauce that way but a girl’s gotta do what a girl’s gotta do. Yuri, to say it was a thrill to have this critiqued by FoodPornDaily and for it to be called porny is an understatement. Please do make this soon. Everyone needs some Kerrygold Mac and Cheese love in their life. I expect a full report Jenna. Silky, creamy, goodness. That looks amazing! Silky, creamy goodness is EXACTLY what it is. i know i said i was going low-carb for a while, but i *really* want to make this mac and cheese. if i make it while my husband is out of town, no one has to know, right? Hima, I suggest you scale the recipe down by half and then swear yourself to secrecy that Kerrygold Mac and Cheese ever existed. Hey, how did I miss this?? Must have been too much box wine over the weekend. This looks fabulous, and I happened to have made a stove top mac & cheese with KerryGold Dubliner on Friday night. Dubliner has a strong sort of funky flavor, so I was judicious with it and blended in a few other milder cheeses. Dubliner you say? I may have to throw a bit of that in the sauce this afternoon. Yes, the wine box probably prevented you from seeing this post when it went up during #bhf11pp. 3 liters of wine has a way of doing that. that picture is one of absolute perfection and i love love love my mac&cheese with some heat! This looks sooooo delicious. I wish I could find Kerrygold around here! Tracy, do you have Trader Joe’s or Costco near you? I’ve found Kerrygold there. Hello from Sharon Ellwood. You have a great website. You’ve become quite an accomplished cook. Thanks for the kind words Sharon. Believe me when I say that not everything that comes out of my kitchen is a winner. Amanda, I’m so sorry to hear about your experience. I’ve made this recipe many times and have always had good results. You say it was sweet…I can see that happening if maybe you mistakenly used sweetened condensed milk instead of evaporated. Is it possible that you substituted some ingredients? Hey. Is this recipe for one person or more? This recipe makes enough to share.